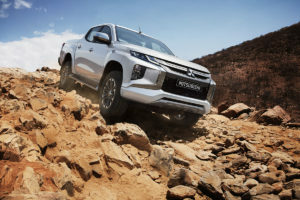 The new Mitsubishi L200 is the latest version of a model which is celebrating its 40th birthday this year, and is produced at the Laem Chabang Plant operated by Mitsubishi Motors (Thailand) Co. Ltd. (MMTh), MMC’s producer and distributor in Thailand. Following the Thai launch, it will be launched in the in other ASEAN markets as well as Oceania, the Middle East, Europe, Africa and Latin America. Eventually it will be sold in some 150 countries around the globe. 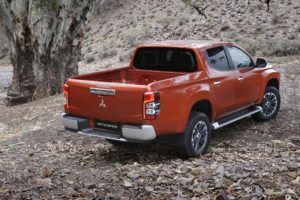 Mitsubishi says the new Mitsubishi L200 features a revitalized design under the concept “Rock Solid” that embodies, both inside and out, the full essence of its “Engineered Beyond Tough” development keyphrase. The front of the vehicle incorporates the new-generation “Dynamic Shield” front design concept: the high engine hood line and beefier-looking lamps located higher up are designed to give the new model a more powerful and imposing front end. New Mitsubishi L200 4WD models are fitted with either Super-Select 4WD, which delivers optimum traction and handling characteristics for any given surface, or Easy-Select 4WD, which simplifies switching between drive modes for different road surfaces. With the addition of new drive modes, both 4WD systems deliver improved off-road performance. Both Super-Select and Easy-Select 4WD systems use a new Off-road Mode which has GRAVEL, MUD/SNOW, SAND and ROCK (in 4LLc only) settings. When engaged, Off-road Mode integrally controls engine power, transmission and braking to regulate the amount of wheel slip and thereby maximize all-terrain performance and self-extraction performance in mud or snow. Hill Descent Control electronically controls the speed to allow the driver to negotiate steep or slippery descents more safely and with more assurance. The new Mitsubishi L200 retains the current model’s ladder-type frame and high impact-safety cabin structure while featuring advanced active safety and driver assistance systems. Ultrasonic Misacceleration Mitigation System (UMS) which reduces accidents resulting from improper use of the accelerator when moving off or reversing in car parks and other confined spaces. Providing convenient driver assistance are the Multi Around Monitor, which generates a bird’s eye view image of the area around the vehicle, and Parking Sensors. The new Mitsubishi L200 features many detail improvements. Braking performance and feel are improved with the use of larger front discs and calipers; ride is improved with the use of larger rear dampers which contain more damping oil and switching to a six-speed automatic transmission from the current five-speed auto to allow smoother, more powerful acceleration and improved refinement. Following its start of sales in Thailand on November 17th, the New Mitsubishi L200 is scheduled to be rolled out sequentially in the company’s markets in ASEAN, Oceania, the Middle East, Europe, Africa and Latin America, eventually going on sale in some 150 countries around the globe. MMC plans to sell some 180,000 units of the new and current models this fiscal year. Mitsubishi describes the L200 as a core global strategic model and it is MMC’s second biggest seller, following the mid-size Outlander SUV in the MMC lineup last fiscal year. European specifications will be announced closer to market launch, which will be at the end of the summer, 2019.